For my final project I am making a 50s style coat. I was having trouble deciding what to make for this project so I decided to make something using a method I have not used very much: sewing. For my up-cycle project I made a 50s style dress out of paper so this project will be a cool way to finish this course. 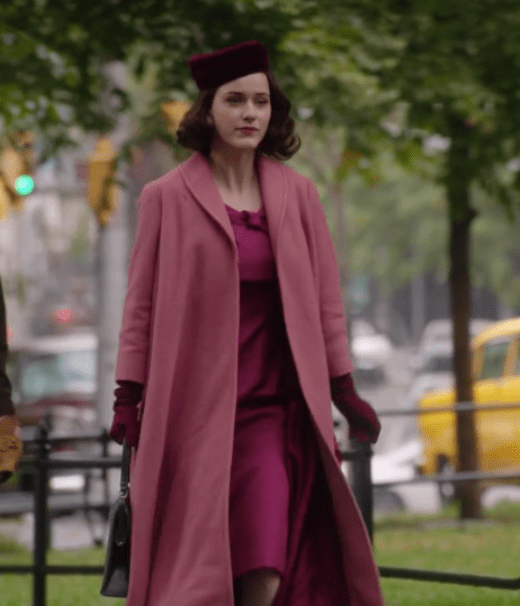 I will be trying to recreate that coat so that I can have an awesome 50s style winter coat that I can actually wear. I am super excited about this project now that I found something I really want to make! Here are some other 50s style coats that look like the coat I will be recreating. The main features are the really long coat with a roll collar. Here is my original sketch that I made when I was still unclear what I wanted to make for this final project. After looking at the scene in The Marvelous Mrs. Maisel when she wears the coat, I sketched the coat out with a little more detail. Front side sketch with sleeve. Then I made some sketches with even more detail. These dimensions correspond to a 1/4 size coat. I realized that the collar was going to be hard to figure out so I made some sketches to wrap my mind around it. I decided to make a 1/4 size version of the coat out of paper to see if it would look right using the dimensions I had figured out. I didn’t end up making the sleeves because they would have stuck straight out if they were made of paper. This helped me figure out some problems with my sketches. 1/4 size coat out of paper. Now I am working on a 1/2 size coat but this one will be made out of fabric. I got some bad quality fabric for free and I decided to make a small version of the coat to see how it will turn out. This will help me decide what kind of fabric to buy for the final product because I will have a better grasp on my sewing abilities. If this coat turns out poorly then I will get some cheaper fabric that will still look good but won’t be super expensive, but if it turns out really well then I will consider investing in some better fabric. So far I have made the paper cut outs and pinned them to fabric. Then I cut out the fabric with an extra allowance for the seams. Next I will sew the coat together and add pockets. I might add an insert to the coat but that depends on how it turns out. If it is bad then I won’t bother but if it is good then I will finish it and my best friend’s daughter can wear it! Then I will use the same process to make the full size coat! Wow this is a super cool project! I am super impressed at the sewing job that you have done even though this seems very difficult to actually make. I like the drawings and sketches a lot and am sure they give you a good idea of how the overall jacket will look like. Awesome! I really like how much research you’ve put into the patterns and different types of collars. This will turn out really cool! This is a really cool project. It’s awesome you’re pushing your boundaries by developing your sewing skills. If the prototype turns out bad and you decide not to make a functional coat, maybe you can morph it into some sort of stationary decoration piece. It looks like you have a pretty complete collection of sketches. Are you adapting existing templates/patterns, or are you starting completely from scratch? Will you be encountering sewing techniques you haven’t used before, or do you have a pretty good understanfing of multiple sewing styles? The coat will be a cool final project, and be a cool piece that you can continue to use long after you are done with creating it. Have you considered the color that you will be using and how that will impact the overall aesthetic of the coat? I am curious on the dynamics of your product and how the clothing will be dynamic? Maybe just the flow of the jacket could be considered dynamic. Sewing will be a great skill to learn. After seeing your presentation I can see that you’ve set yourself up for a tedious and difficult process to create a coat. I really like the effort you are willing to be in to your project and I am excited to see what you end up making. I would recommend creating a building process/schedule, so you can make sure you have all your steps in the correct order. The idea of making a coat after experiencing making clothing out of paper is a great full circle moment. It’s nice that you are using real fabric this time as opposed to paper, it looks like you really put a lot of thought into the idea. I cant wait to see how this turn out! Your upcycle dress was very impressive, so I have high hopes for this. I would recommend watching a few videos on youtube before you take this on. I love that you are learning a new skill to make this project. The sketches are incredibly detailed and explain the dimensions and your ideas perfectly. Your prototype has great detail. Have you tried to look up previously made coats like this for the neckline? Or maybe talk to a tailor or seamstress to get a better idea? My wife and I watch this show and reluctantly I like it. Best of luck with the sewing. I bet you could go to a sewing shop and ask them to give you advice and tips. Great drawings and sketches.